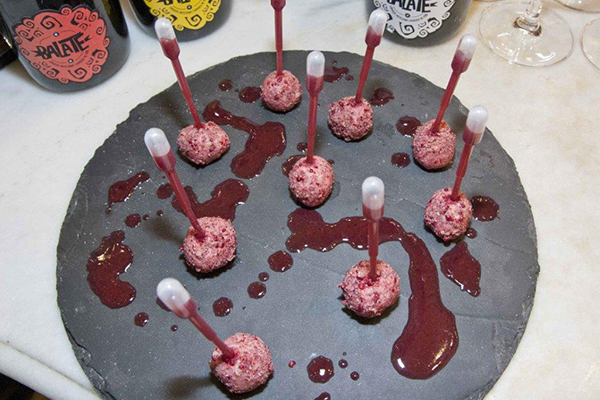 Lhardy restaurant, placed in Madrid city center, has decided to give an innovation touch to its cuisine with the well known candy Pop Rocks®, creating the explosive snack “Goat cheese snack with Pop Rocks© and raspberry coulis”. -¿How it became the idea of this bar snack? – Ricardo: Well, I actually had seen the creations of other chefs where they have used Pop Rocks® as an ingredient, and I liked the idea, it seemed interesting to me and I decided to innovate in my cuisine giving the explosive touch of Pop Rocks© to my snack. – Which ingredients has exactly this explosive bar snack? – Ricardo: This snack consists on a goat cheese croquette with cream, and also a mix of chocolate krispies and Pop Rocks©. It has also a “pipette” of a raspberry and Oporto liquor. – ¿How do you cook it? – Ricardo: Firstly you take a piece of the goat cheese and transform into a croquette with the cream. To batter the croquettes, you have to mix the chocolate krispies with Pop Rocks®. Once you have done all the croquettes, you can batter it in the mix. Last, you have to put the “pipette” and it will be ready for eat. – When do you give the snack to the dinner guests to taste it? – Ricardo: Because of the celebration all the year of the 175 birthday, we have introduced the snack in different events as a “pre-dessert” where it have gone both political and television celebrities, as well as one special event that we did for the media. – ¿It has had a great success? – Ricardo: Actually it has surprised everyone because is a snack with an explosive mix of flavors (acid, sweet and salt). Pop Rocks®, as an innovative ingredient, has been used in different applications, both in homemade recipes (desserts, starters, drinks,…) as in the avant-garde cuisine creations, from the chefs like Ferràn Adrià or Oriol Balaguer. Zeta Espacial, Pop Rocks® manufacturer, offers a wide range of popping candy for retail or as ingredient. A world of possibilities that Lhardy restaurant of Madrid has tried to explore, creating this explosive and innovative snack.